According to the care sheet, zebra finches should happily eat banana, melon, kale, carrots, eggs and whole wheat pasta, among other things. Not our birds. Not in this lifetime. They’d happily watch those foods spoil in the dish. Now, millet is another story. Syd and Bart live for millet. Or rather, Syd lives to enjoy millet; Bart lives to take the timothy hay out of their hay ball and throw it on the cage floor and to take baths in the water dish. 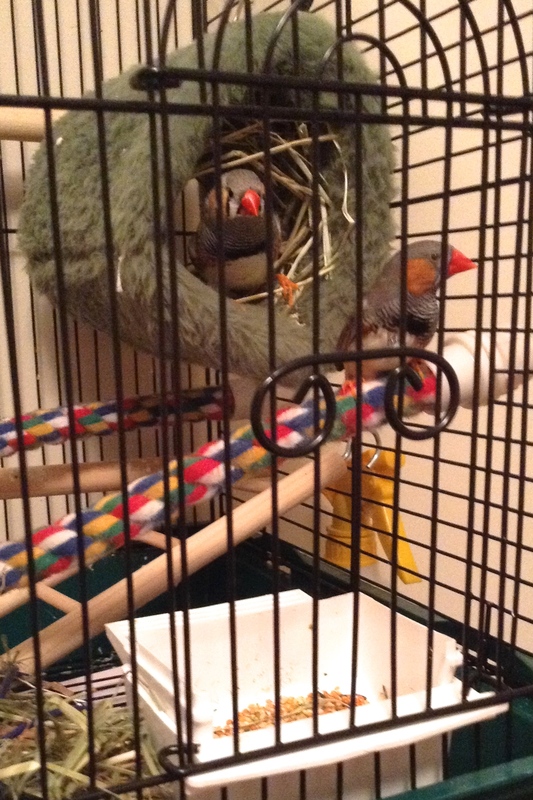 Clearly, our sweet finches don’t know how to choose what’s good for them. Neither do people. If we knew how to choose what was good for us, we wouldn’t try to find our stress relief or even our happiness in food, alcohol, drugs, work, money (earning, spending or saving it) and so on. None of these things can satisfy us. Instead, we would choose God. We would choose to spend time with him—praising and worshipping him, sharing our joys and sorrows and worries with him, learning the path he wants us to take and then following it. This coming weekend, Canadians will celebrate Thanksgiving. As we gather with family and friends, we could take the opportunity to give thanks for God’s presence in our lives and his constant and loving care for us. Those of us whose children have started down the road to receiving their First Eucharist or being confirmed could renew our own commitment to living out our faith. We could commit to spending time in Eucharistic adoration, praying the rosary on our own or with others, or making more time to read the Word. If we’ve been away from the Church, we could receive the sacrament of reconciliation and then fully participate in the Mass. And those who have found a spiritual home in the Catholic Church could take the opportunity to learn more about their faith and the Church through the RCIA program. I pray that we would learn how to choose what is good—God, and faith and trust in him—and that our loved ones, friends and colleagues would be drawn to him because of our example. Thanksgiving Monday may be well under way and the long weekend nearly over, but I’m still thinking about thankfulness and gratitude today. At Mass yesterday, we heard about the ten lepers Jesus cleansed, only one of whom turned back to thank Jesus and praise God for his healing (see Luke 17:11-18*). Our priest reminded us to do two things: thank God for our blessings and remember that all we have is a blessing from God and not simply the product of our own work. Often we hear about “self-made” men and women who rose from humble roots to wealth and power. What we may not hear about is the teacher who encouraged that person as a child, the employer who gave that person a much-needed job and thus the means to pursue his or her dreams, the valuable contact that person made at a key moment. And if these people are mentioned, the timely meetings may be chalked up to “luck” and “good timing.” Not to blessings from God. But as our priest pointed out in his homily, if we are born alive when others are stillborn, if we have hearing or sight or the ability to talk or walk when others don’t, if we have children when others can’t, if we have a job when others don’t, these are blessings that we should thank God for. We tend to take life, good health, and physical and intellectual abilities—our own or loved ones’—for granted until they’re in jeopardy or lost. Instead, we focus on what we lack or would like to change. For example, I could dwell on the fact that I’m 40 and not at my ideal weight—or I could be thankful that I’m alive and in good health overall. That I can still see a beautiful sunset and hear my favourite music. Or I could focus on the challenges of parenting a teenager and the fact that we don’t always see eye to eye—or I could thank God that he is healthy and active, knows his own mind, and has goals and dreams to pursue. Whether we celebrated Thanksgiving yesterday or plan to do so today, I pray that we would recognize and be thankful every day for the ways God has blessed us. Last fall, I took a course on creating and maintaining a blog. After I shared my Thanksgiving dinner story with the other students, they encouraged me to use it for a post. Since we’ll be celebrating Thanksgiving this weekend, I’d like to share some of that story here. My parents were joining us for Thanksgiving dinner, and so I cooked a turkey raised by Dad. That turkey was Goliath: he tipped the scales at 24.5 lb. The microwave was too cramped for Goliath and he went right into the roasting pan. Sort of. Goliath lay on his side in the pan, covered in tin foil so his skin wouldn’t crisp up too quickly. Trying to turn Goliath was a Herculean task. I wished I had roasting forks as I heaved Goliath onto his other side while my husband gripped the pan to keep it from shooting onto the floor. After six hours, Goliath finally fit in the pan. After I’d snapped off one wing and tossed it into the drippings, that is. At long last, the turkey was ready. I heaved Goliath onto the platter to serve…three people, since my father had the flu and my parents stayed home. That was one big turkey. We were thankful for our dinner and for the many containers of leftovers we put in the freezer that night. We can be thankful that we know about God’s love. That we have food, clothing and shelter. That we can spend Thanksgiving with our loved ones. And we can express our thanks by supporting our parish, donating to the food bank and outreach programs that help care for people in need, and welcoming extended family and friends into our homes for Thanksgiving dinner. From the large (such as the ones I’ve mentioned) to the small (such as the fact that my husband fractured rather than broke his finger during his taekwon-do test), I pray that we would be grateful for the blessings in our lives and take time to count them and thank God for them.